This report first appeared in Sculpture, 19(7), page 7 in 2000 with the title "Iceland heats up". Anna Eyjolfsdottir. Signaling Coastline (2000). 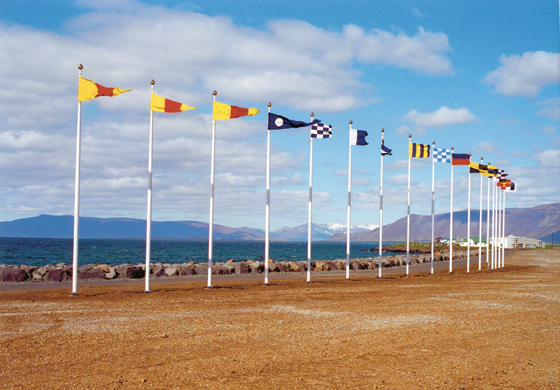 Flag poles, ships‘ signal flags; 600 x 3600 x 120 cm. Installed at Reykjavik Harbour as part of outdoor exhibition: Coastline 2000, Reykjavík, Iceland. Photo: Helgi Hjaltalín Eyjólfsson. The 17 ship-signaling flags spell out “Coastline” in Icelandic to ships that approach the land. It looks as though 2000 is the year to visit Iceland. As a European City of Culture, Reykjavik has played host to more than 80 sponsored art exhibitions and events, with sculpture in galleries, interventions in its unique landscape— even poetry floating on a world-famous thermal swimming pool. The overall budget for Reykjavik 2000— including visual arts, humanities, science, and sports programming— is about $8 million. The theme of the year’s activities? Culture and Nature— amidst Iceland’s vast wilderness and glaciers, lava areas, and geysers. City of Culture designation has offered Iceland the opportunity to spotlight its own artists and those from abroad. Highlights included solo shows at the National Gallery of Iceland by Italian artist Claudio Parmiggiani, who exhibited sculptural and installation works; photos by American Minimalist Roni Horn; abstract three-dimensional colored-paper works by Iceland’s Svava Bjorndottir; and Jon Gunnar Arnarson’s installation Cosmos (1982, first shown at the 1982 Venice Biennale), which approaches “infinite space and Earth’s gravity.” New Worlds—Digital Visions” featured collaborations between artists and computer experts, as well as an exhibition of Icelandic video art. At the Reykjavik Art Museum’s Harbour House, Fabrice Hybert exhibited a self-referential installation that recalled his previous works in Sweden, Norway, and Finland. At Galeri i8, Tony Cragg, Catherine Yass, and Birgir Andresson, Iceland’s 1995 Venice Biennale representative, each had exhibitions. Other solo shows featured Anna Lindal, Elsebet Rahlff, Iris Elfa Fridriksdottir, and Guony Magnusdottir. Art in an environmental context included “Coastline 2000,” featuring 15 works on the north shore of the city, including In Iceland Fish are Important, So is the Tongue (2000). For this piece, Hannes Larusson built a viewing shelter in which “the spirit of Icelandic culture moves over the face of the waters.” “Art in Energy Centres” was exhibited at two hydropower stations. On the group-show front, “TERROR 2000” by artist group ROR, “treated the current and overwhelming belief in modern technology with merry absurdism,” and “Norrut” featured tapestries by Nordic artists using unique methods to interpret this rich tradition, including Gourun Gunnarsdottir’s “3-D poems of nature.” Steinunn Thorarinsdottir exhibited work with sculptor Asmundur Sveinsson, reputed to be one of Iceland’s grand sculptors of the past. In “Re-Location,” Dutch video artists Madelon Hooykaas and Elsa Stansfield exhibited work at Hafnarborg Gallery. At the Living Art Museum, the three-part exhibition series “White, Blue and Red” has seen “White” and “Blue” come and go; “Blue” included works by Brits Sarah Lucas, Gillian Wearing, Michael Landy, and Angus Fairhurst. As northern light fades into winter, “Red,” which opens in October, will focus on the dangerous life and political views of Roska (1940–96), a radical Icelandic artist. Several other art events will complete the year’s schedule, including exhibitions by Sigurdur Arni Sigurdsson, Sigurour Guomundsson, Magnus Kjartansson, Vignir Johannsson, Gujon Ketilsson, and Finnish “fire-artist” Jyrki Paratainen. A group show of South Africans is slated for November.